Running has always been a passion of mine, but it is also one of the main ways I stay mentally (as well as physically) healthy. I lost that outlet for a while last winter due to injury and it took me many months to regain what I had lost. Happily, by summer I was back fully fit—and even better because my rehab had improved my strength, balance, and flexibility. I’m grateful for the process and I wanted to celebrate my return to wellness in a way that adds abundance to the community that helped me get back on my feet. 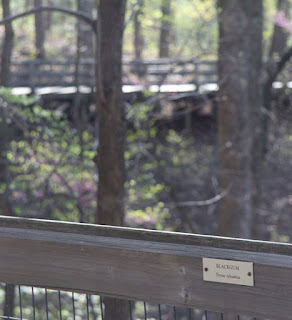 Charlottesville is blessed with many beautiful (but often hidden or even private) places to experience nature. 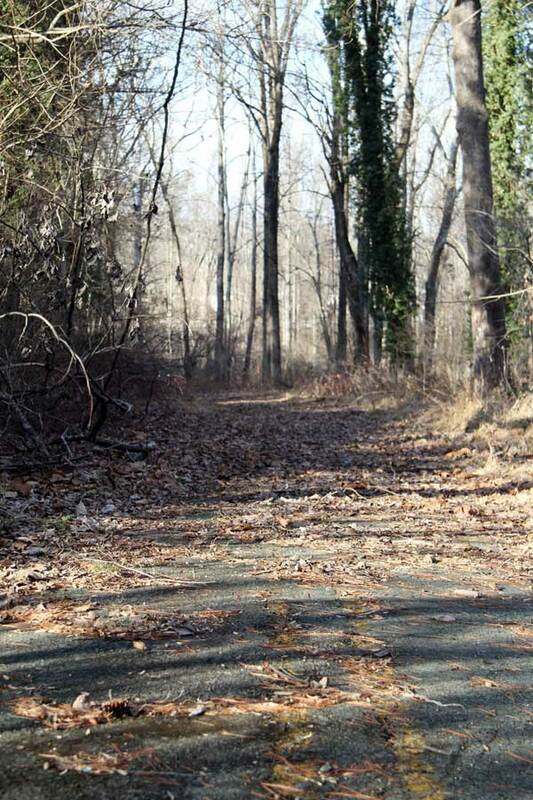 Perhaps the crown jewel is the Rivanna Trail, a twenty-mile hiking path that encircles the city. 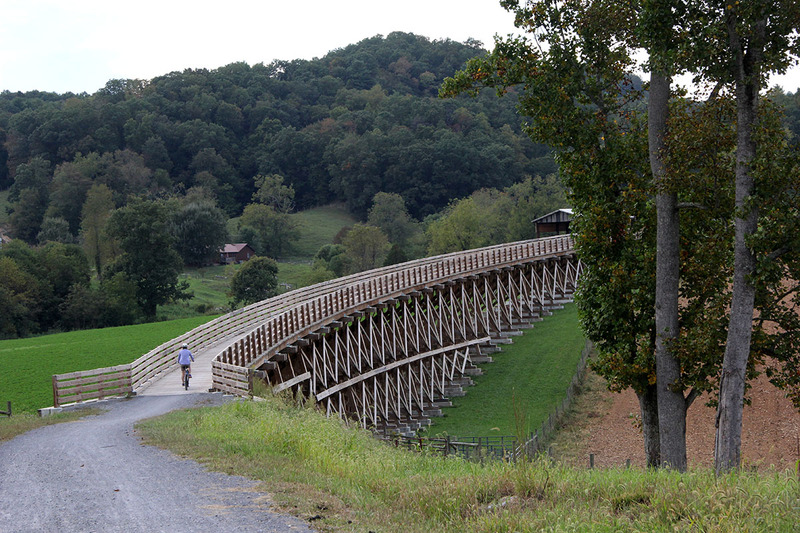 It is a favorite spot for running, walking and mountain biking and I have probably logged thousands of miles on it—but I’ve never done the whole thing at once. 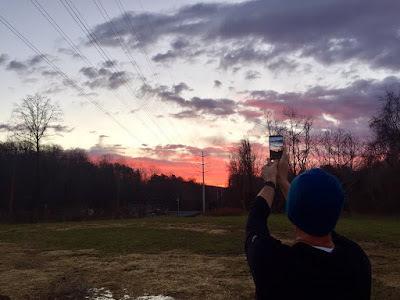 There is a group that runs the loop every year around the winter solstice so I made that my goal: I trained and prepared for the 20-mile loop run in December as my own celebration of good health. From my 20-years’ work on the New York City Marathon I knew that running—that seemingly solitary sport can—can also be a massively collective celebration of the Possible. I wanted my personal milestone to happen in a way that could inspire other people, draw strength from those around me, and have a direct positive financial impact: all things that happen abundantly with the five-borough race. I decided to do the run as a fundraiser for my employer, the Piedmont Environmental Council, which among other things promotes trails in my area. This decision to run for a cause had consequences. It made it larger than me and created accountability. Once I announced publicly that I would do it, there was no going back. It also rallied lots of support to my side in the form of encouragement from family, friends, and even a group of my teammates who volunteered to run all or part of it with me. That group of champions happened to include the physician who oversaw my rehab, which was a nice connection. The run got delayed by a week due to epic flooding on the trail, which was actually kind of good because it landed the run on the day after the Solstice. It was a bit of a sogfest: we still had to wade through waist-deep water in several places. It was also more beautiful than I had imagined, with a mist, clear light and a big full moon that set at sunrise of that first lengthening day. Although I was obviously tired at the end and it was plenty challenging, it was easier on my body than I had expected. That might result from the joy of celebration: it felt more like renewal than closure. I easily exceeded the modest ($400) goal I had set. I could have probably raised much more but that wasn’t really the point. I mainly wanted to demonstrate that the ways that we each personally strive to become better at whatever we do can be shared with others. It will inspire them; and when they rally to your cause, it will further energize you and make your goals easier to obtain. I’m telling you this in the hope that it will inspire you. As you make plans and do your cool and even wacky projects, be sure to let other people know about them so they can help you and get better together. It’s good for everyone. 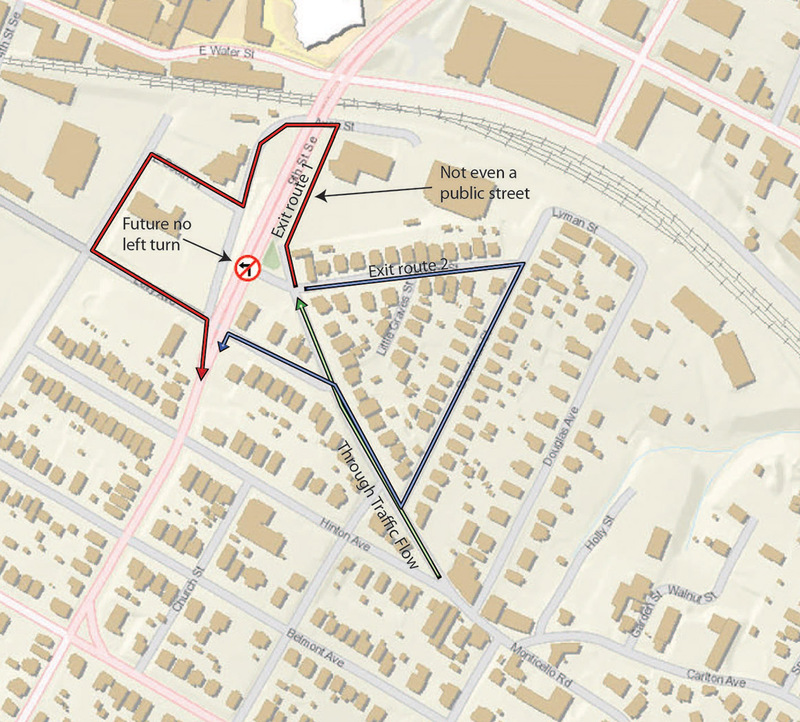 There is a proposal to flip the direction of westernmost block of Monticello Road (currently west-bound) because of some restrictions stemming from the Belmont Bridge replacement. Charlottesville Traffic Engineer Brennen Duncan has proposed an interesting change to Monticello Road. He suggests flipping the direction of its westernmost block as a short pilot (one day). If that goes smotthly, he will try it for longer (six months) prior to making a permanent proposal. I actually like the fact the he is trying new things and this is a spirit of problem-solving that the City really needs, so I support it. The change also could allow some significant bicycle improvements. I wish he didn’t have to seek this solution because, in my view, the cause is unnecessary. 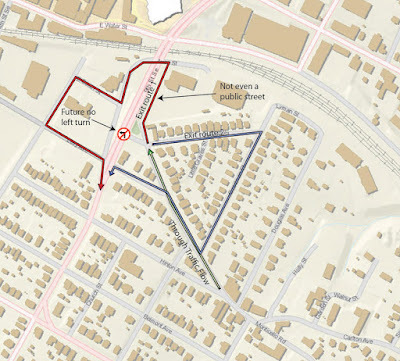 As part of the Belmont Bridge replacement plan, left turns will no longer be permitted from Monticello Road (technically Graves) onto 9th Street (the Belmont Bridge). This will make life extremely inconvenient for anyone who lives or works at that end of the neighborhood, as all current substitute routes are quite circuitous and include stretches even more problematic than the original turning movement. Support for this change was tepid to negative (see note). Still, the engineering firm insisted (due to projected traffic flow improvements) and got the element included in a final design concept approved in a late-night City Council vote. I'm tired of fighting about the Belmont Bridge and ready to move on. 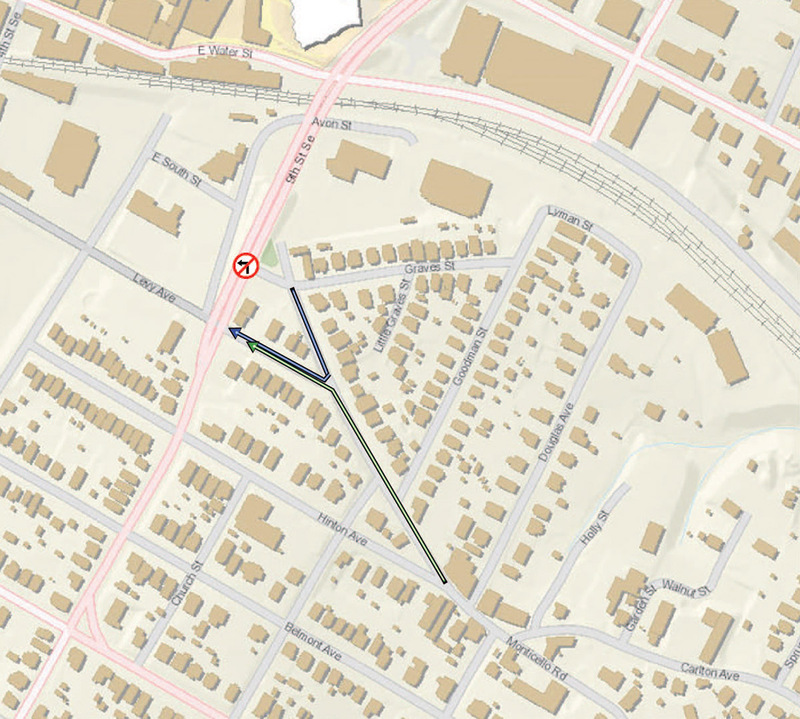 To solve the problem before us, Brennen proposes flipping the direction of the final block of Monticello (currently westbound only) so motorists will be able to exit via Levy Street, which has a traffic light. All traffic flowing westbound on Monticello will bear left and exit at Levy, as well. The eastbound movement includes a hairpin turn; so to create the necessary turn radius, they will need also need to move parking from the current north side to the south side. This solution is not perfect but it is rather genius in its simplicity. 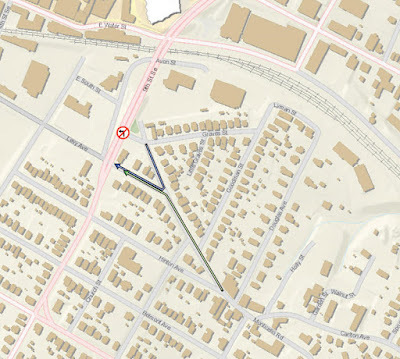 We also hope to use the occasion of repainting to add a badly-needed contraflow bike lane so cyclists will be able to travel both directions on Monticello Road, which is the safest and easiest connection from downtown to points southeast. There are community concerns, which Brennen lays out in his memo, but his contention is that we will never really know until we try it. I see no harm in giving it a shot: in a City that is often very risk-averse, I salute his spirit in trying something new. He’s proposing to do it in a very low-stakes way and if it works, maybe the City will be encouraged to try other new things. I’m disappointed that the Bridge design team created this problem—they didn’t need to and it undercut some good community engagement they had done earlier. But I’m ready to move on and if we truly are stuck with it, then I think we should try Brennen’s creative approach to dealing with the consequences. We should support City staff trying new things in a thoughtful, do-no-harm way. If we don’t like it, we can change it back and if we do like it we will have something no one else would have thought of. City Council will here Brennen's report at the end of its August 20 meeting. The meeting starts at 6:30 and you may make comments then. Brennen's report will be much later (probably after 9:30) and you may also comment at the end. His report can be found here (page 141). Note: Design firm Kinley Horn did not put the left turn out of Graves into public discussion--the alternatives they offered assumed this change. My memory is that the community opposed this and the documentary evidence support this. See voting sheets and presentation in which all options assume this closure. Feel free to point me to evidence of public support (besides their own notes) and I will stand corrected. Their resource page is here. When I asked the youth which part of the trip they liked best, they all said the same thing: "The Museum." I could not disagree. Last week, I had the good fortune to tag along with the Youth Leadership Team from Friendship Court, as well as some friends and mentors, on a trip to Washington, DC. The purpose of the visit was for the seven high school students to learn more about Equity Planning, property development and how the two intersect, through the lens of some specific projects. 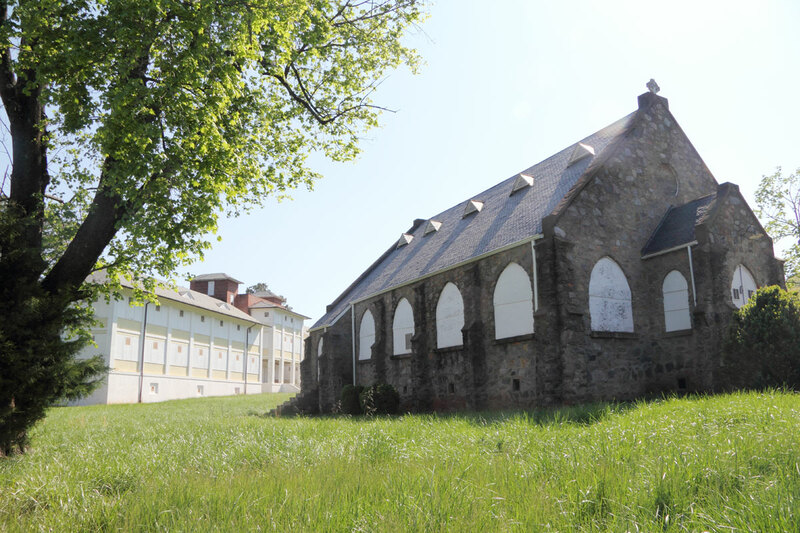 It was the culmination of a two-year program of civic education to empower them to be active contributors to Friendship Court’s redevelopment plan. After taking the morning train and depositing our luggage at a rented townhouse, we traveled to Southeast to meet with Vaughn Perry, Equitable Development Manager of the 11th Street Bridge Park. The 11th Street Bridge project is one that I have been following closely because it is cool in so many ways. Attempting to bridge the Anacostia's social divide is challenging enough but they are also setting a new standard of positive social impact. The project is relentlessly community-driven. It started with an honest discussion of whether the neighbors even want the park, and if so what kinds of features, uses, and programs will make the project appealing and useful for the entire community—especially those under-served neighborhoods on its south bank. This striking architectural project is accompanied by an equally bold Equitable Development Plan, which has specific strategies for workforce development, affordable housing, and small business enterprise. Although it's by no means required (or anything like standard practice), they’re on track for a 1:1 match of community development monies raised to park project funding. From a physical standpoint, it’s still just a plan, although work is slated to begin in a year or so (a speed made possible by the fact that it is being built with local, not Federal, funds.) Still, they are not waiting for the physical structure to start pulling people to the river or to pursue their equity mission. 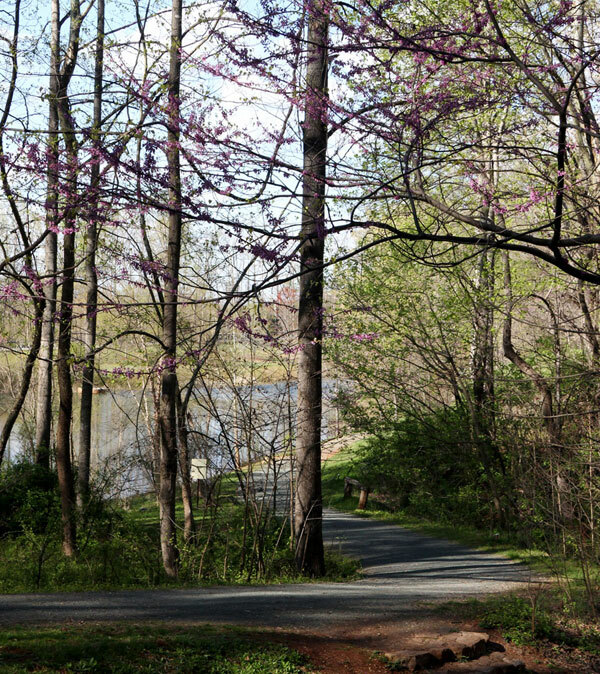 They co-host a major festival in adjoining Anacostia Park, as well as youth programs (focused on gardening and the river), neighborhood-specific public art, a Ward-8 home buyers club and more. They host periodic walking tours and I think we should take a group from Charlottesville. In any case, this is definitely a project I will continue to watch. The meeting with Vaughn was a big highlight for me, but it was just the beginning of an ambitious agenda. The youth also met with Matthew Steenhoek, vice-president of the firm that is developing the massive mixed-use District Warf project. They had a private visit (!!!) 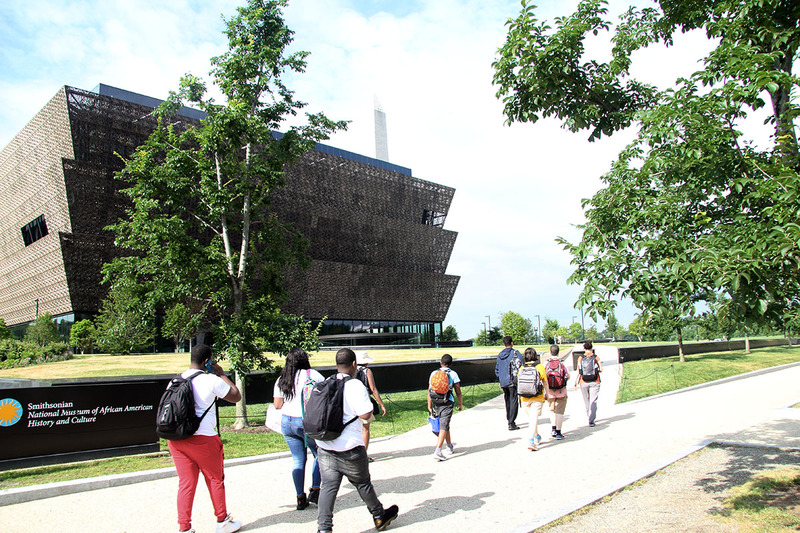 to the National Museum of African American History and Culture. And, they toured SeVerna on K with Mel Thompson, of Grimm and Parker—the firm selected to redesign Friendship Court. SeVerna is very similar to the envisioned future of Friendship Court and it was very enlightening to walk through an actual space (including some apartments)--much better than looking at plans or drawings. I think it would be useful for more people to do that. It was a whirlwind trip, with a lot to take in and no small amount of walking and riding around the capital city. It was great to hang out with the kids, most of whom I’ve known since they were very young. It was also quality time with some of my favorite adults—Barbara Brown-Wilson, Claudette Grant, Beth Meyer and Margaret Haltom. It’s nice to be with friends but it’s especially great to be together in beautiful spaces and to see real-world expressions of ideas we talk about so much. I'm looking forward to applying some of what I learned to my work in Charlottesville. 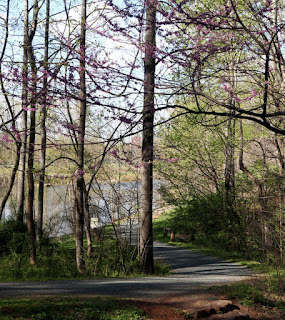 Monticello is one of several connections we are trying to create between Charlottesville and surrounding assets in Albemarle County. 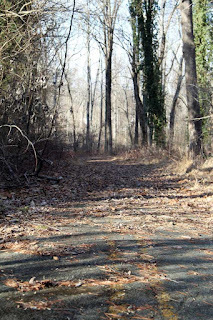 Here, the an existing social trail to the future Biscuit Run Park that should be made safe and legal. I was horrified to look at my blog and discover nothing since 2017! It's not like I haven't been writing; simply the Monticello Connectivity Project is being included in a larger and very ambitious regional connectivity project I'm working on now. I'm writing ALOT on that project's web site. 1937 aerial photo of Charlottesville's southeast corner, transposed on the contemporary landscape, with the intact portion of Monticello Road highlighted in blue and its lost portion red. 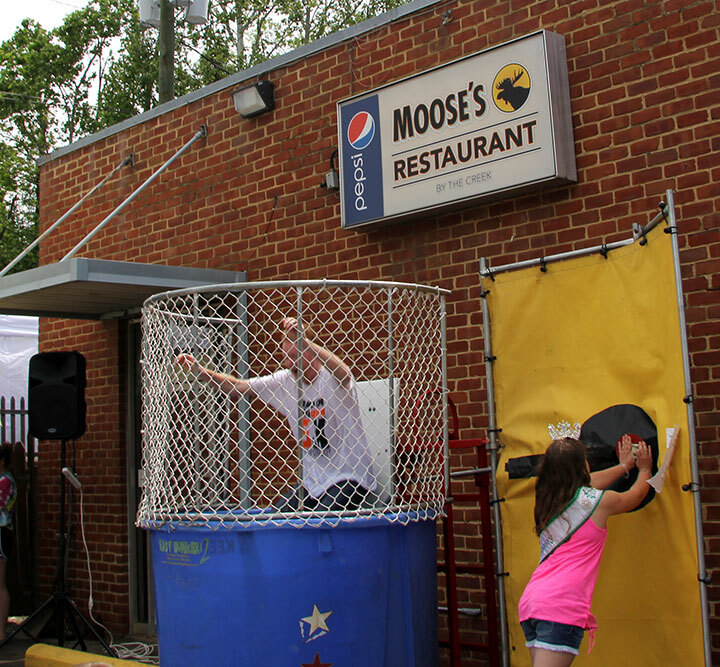 (Photo: City of Charlottesville). Chris Gensic sent me a set of aerial photos that give us the best idea yet of Monticello Road's historic route, and specifically the course of the section that is buried under Interstate 64. This 1937 photo predates the construction of Monticello Avenue (the route of which appears on earlier plats)--and it definitely predates I-64. It's interesting that at the time, Monticello and Scottsville Roads were united within the City limits and only diverged after crossing Moore's Creek--that's why it makes a hard left turn. We were wondering the road's exact relationship to the creek: where it crossed, which bank it followed and precisely where it turned cross-contour. 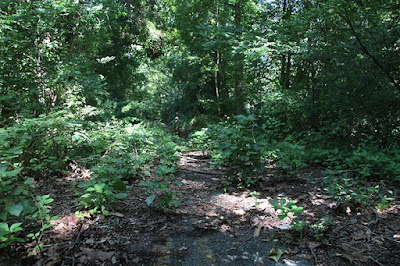 We want to understand that so we can make the most historically authentic connector trail. 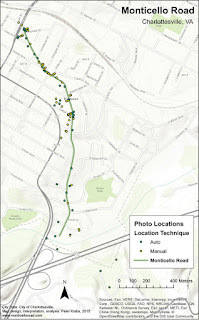 I georeferenced Chris's photo, then made a shapefile of the old road's course and added it to my database. 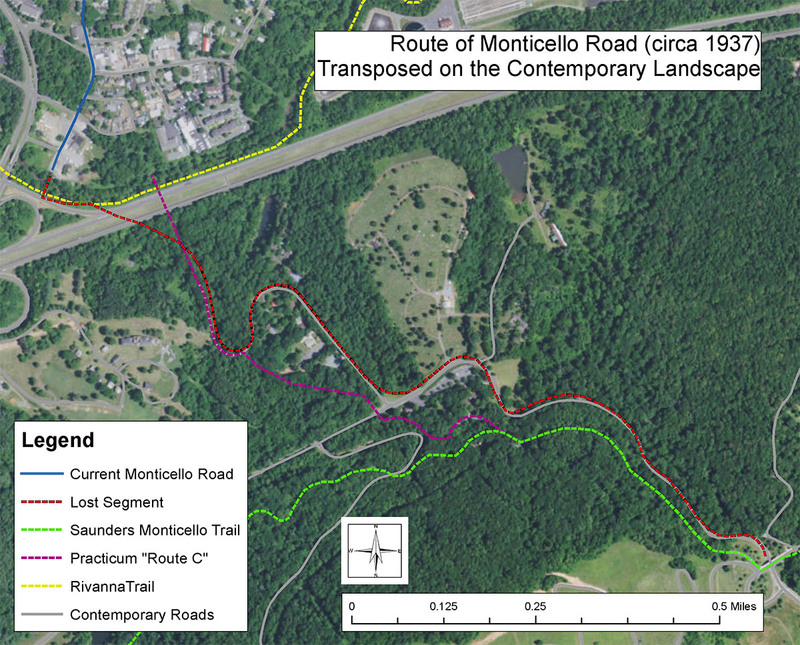 The former course of Monticello Road (red) and some nearby trails, including the connective corridor the Practicum Team studied (purple). A future trail will not necessarily follow the precise route. 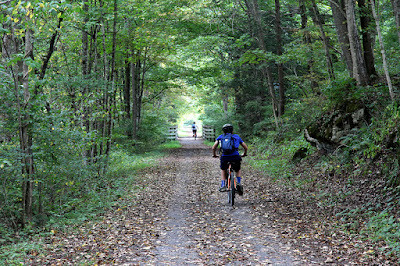 Practicalities about crossing the creek and interstate, finding gentle slopes and keeping pedestrians separate from cars will all influence the trail's siting. However, of the four corridors the Practicum Team considered, this one is the truest spatial expression of the City's connection to the Heritage Site. 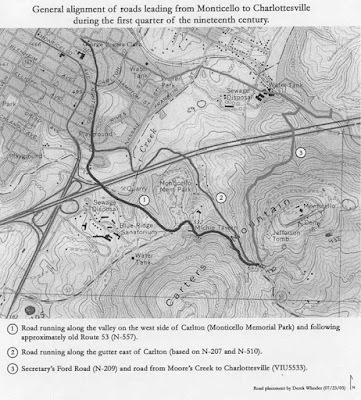 Accurately locating the original road course (at least its early 20th Century incarnation) will help trail planners weave a more multi-faceted trail experience. After presenting the Monticello Connectivity report, people asked what I was planning to do next. 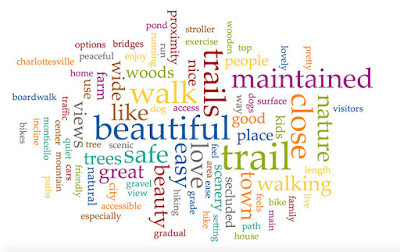 My answer was often, “Hopefully something like this.” That wish received a nice down-payment when the UVa Foundation’s Morven hired me to work with their staff and two Architecture School interns to study the feasibility of trails at (or to) Morven. Morven borders James Monroe’s Highland and is about two miles from Monticello. 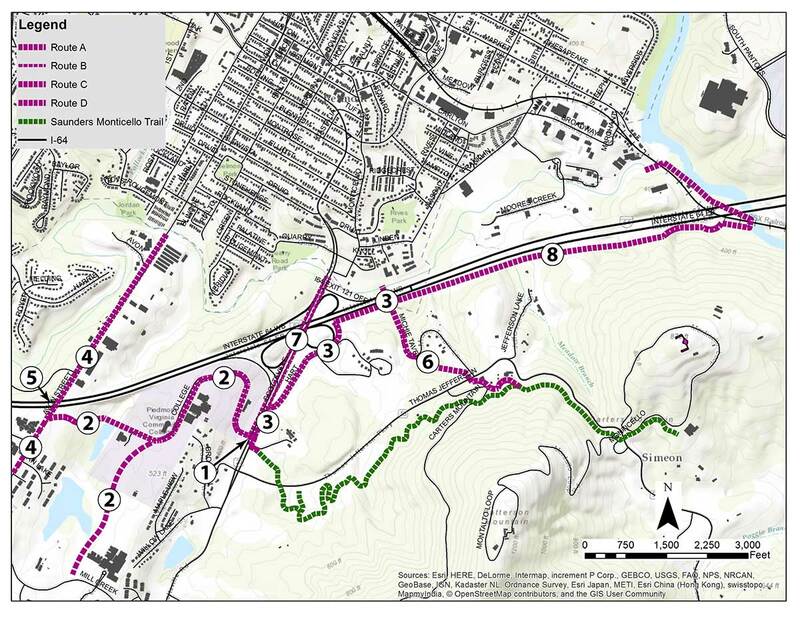 There is growing interest in a trail connecting the historic sites, which would vastly extend the connected network we are already developing. 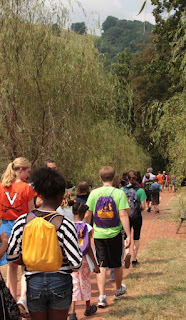 Students from the Morven Summer Institute hike on one of Morven's many undocumented--but beautiful--trails. 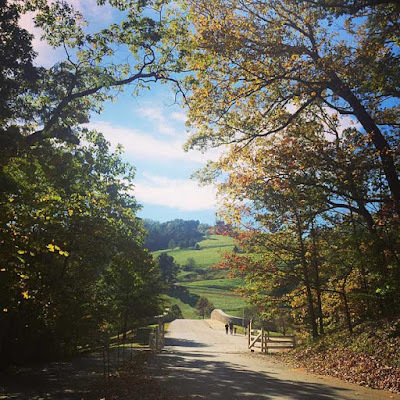 Morven is a 2,913-acre farm bequeathed to the University of Virginia in 2001. Besides hosting a full calendar of events throughout the year, Morven is the site of a Summer sustainability Institute, a Leadership Forum for future African leaders, a forthcoming women’s initiative and the University’s Kitchen Garden. Along with Monticello, Highland, Montpelier, the University of Virginia, the College of William and Mary, Morven is part of the Presidential Precinct. That alliance is mostly programmatic but I’ve long wondered if its alliance could be spatial too, which would open a vast (approx. 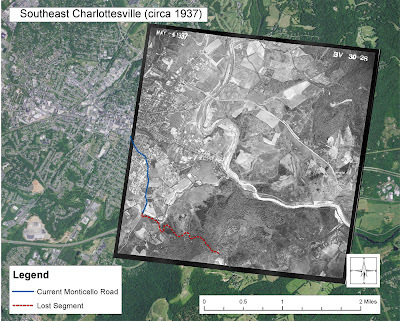 6,000 local acre) domain of connected discovery right on Charlottesville’s border. 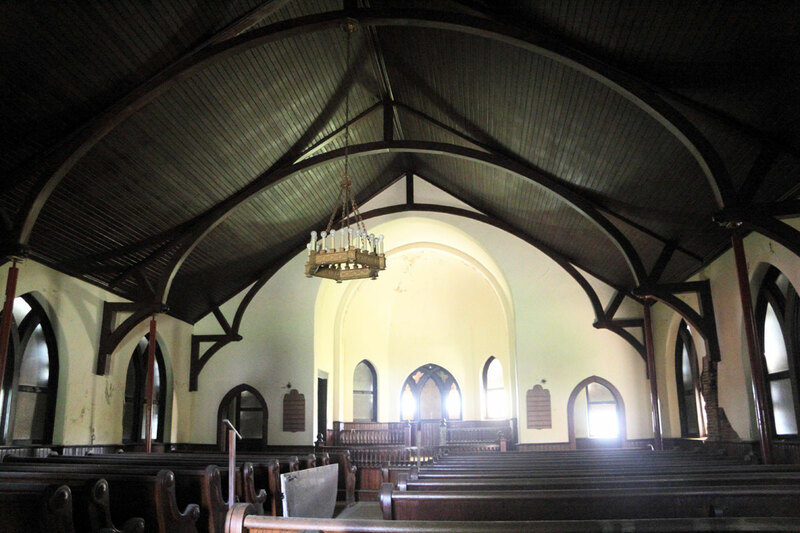 Morven is less well known than some of its neighbors, but it is equally beautiful and historically fascinating. As part of his effort to gather his friends as neighbors, Thomas Jefferson facilitated the sale of a property known as “Indian Camp” to his friend William Short in 1796. They planned to divide the property into 100-acre tenant farms as an experiment in free yeoman agriculture that Jefferson so often extolled but did not himself practice. Obviously, that model did not sweep the American South, but it’s a fascinating story with profound implications and many other histories are layered above and below it. 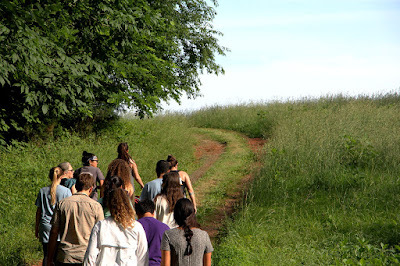 Combine them with an incredible landscape and UVa’s forward-looking sustainability program and Morven becomes a multi-layered cultural landscape well worth exploring. 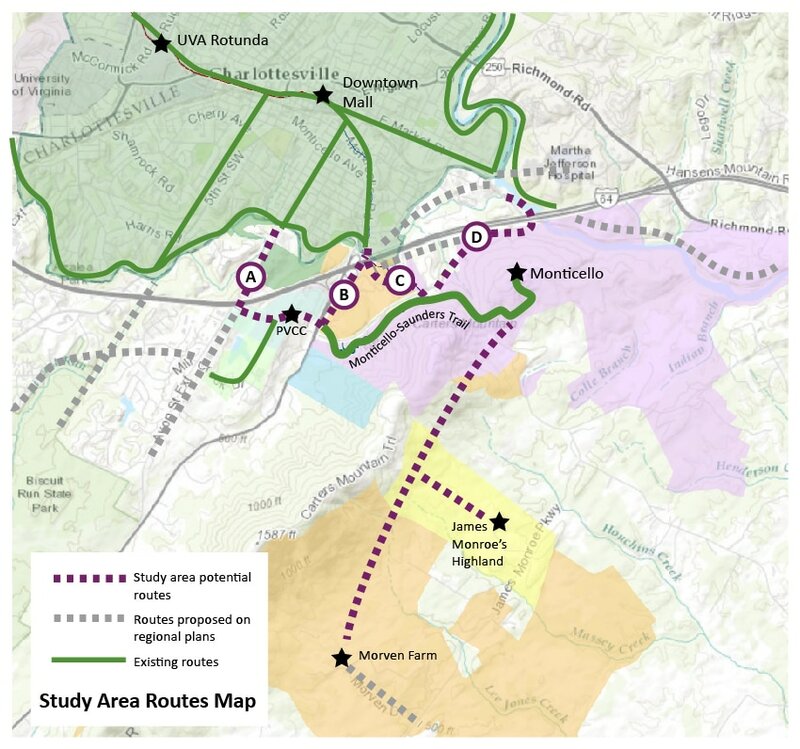 What's Next for the Monticello Connectivity Project? 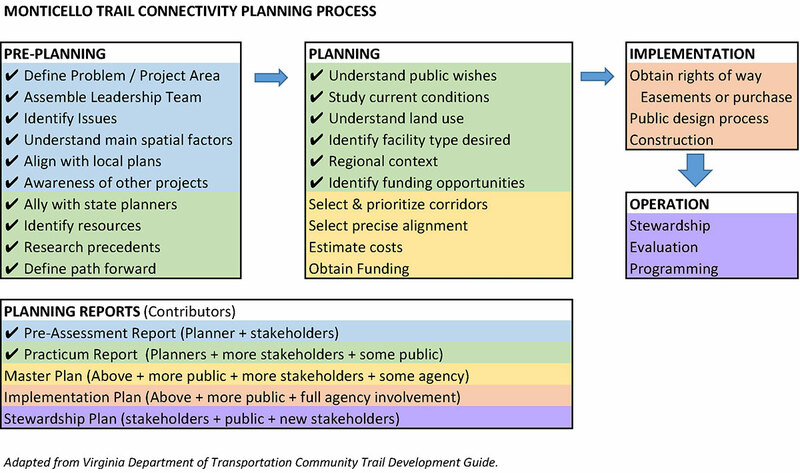 This diagram combines the theory-of-change logic model I designed last year with VDoT's excellent Community Trail Development Guide and is part of the Practicum report's conclusion. Right now, we are in the yellow portion of the process. The Charlottesville to Monticello Connectivity Study was well-received by many people we respect, including stakeholders in government, non-profits, academia and—best all—the community. We didn’t start this venture but I think we helped move it forward. Charlottesville to Monticello & Beyond is a report I co-authored about re-connecting Charlottesville to Monticello for pedestrians and cyclists. The entry explores the core of the report: a comparison of four possible connective corridors. My deepest gratitude to my co-authors (Maura Harris, Caroline Herre, Joel Lehman, and Julie Murphy) whose ideas and language infuse this entry. 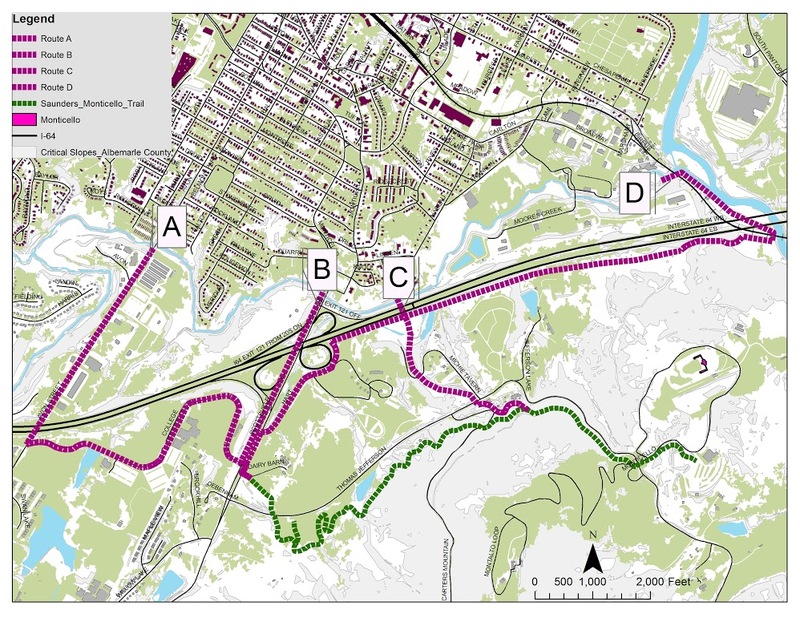 The practicum team and its advisors studied four corridors to connect Charlottesville to the Saunders-Monticello Trail based on City and County Comprehensive Plans, which are closely aligned on this subject. 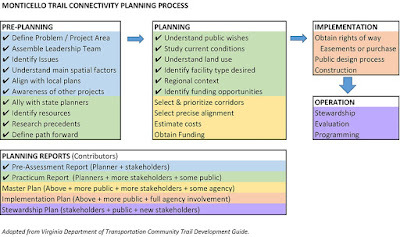 Although it is possible to get from source to destination using other routes, such as stream valleys, our analysis had to be finite and build upon our stakeholders’ previous consensus-building work. 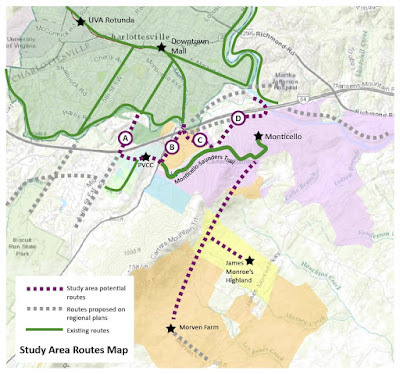 Our work focuses mainly on transportation corridors, while acknowledging that a truly comprehensive outcome will probably make other, more recreational connections, too. 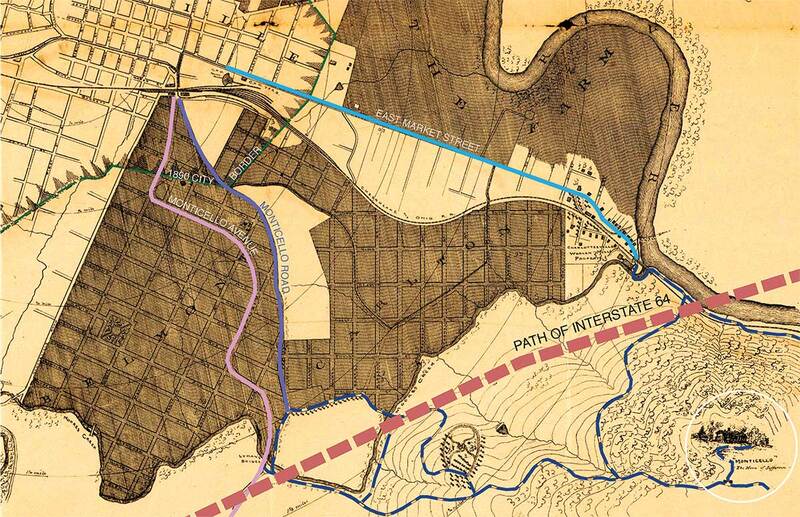 For convenience, we named these corridors Routes A, B, C, and D.
1890 Charlottesville Land Company Map, showing several of the lost roads (dashed), Monticello Road and Avenue and Market Street (which still exist) and the path of Interstate 64. (Special Collections Library, University of Virginia via Scholars’ Lab). Click to enlarge. 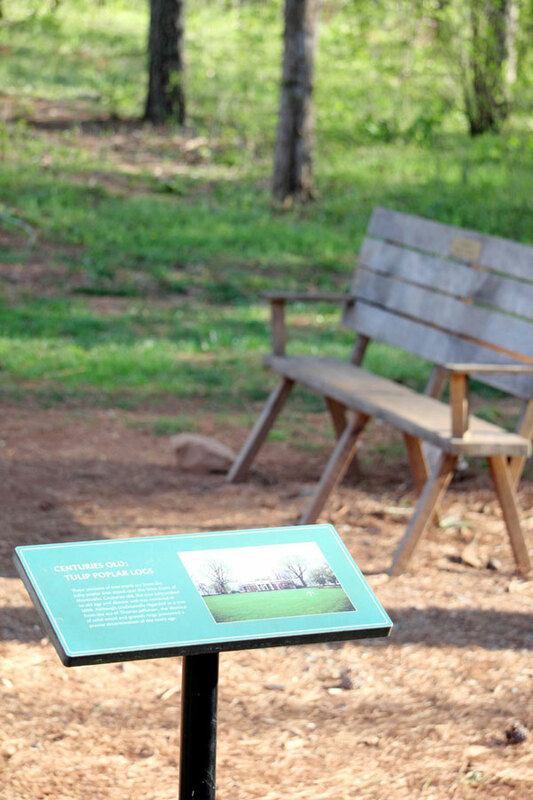 For most of its history, it was easy to get to Monticello. 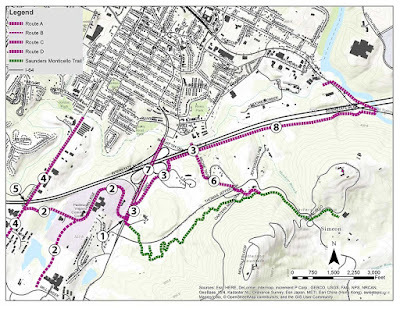 There were multiple possible routes: through Woolen Mills, Carlton, present-day Monticello Road and present-day Route 20. There was busy commerce along all of these routes and there is enduring evidence—and local memories—of that. The advent of the automobile did not itself cause a disruption. 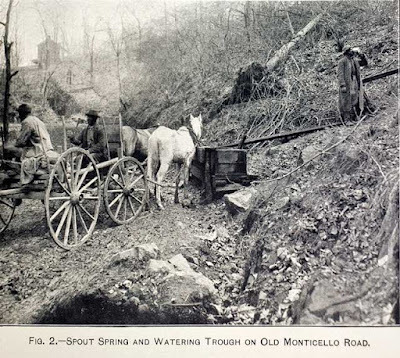 During my earlier work studying Monticello Road, I met long-time residents who used to travel that route and I heard amusing stories of joyrides along the steep and winding road into town. Construction of Interstate 64 in the 1960’s sliced between Charlottesville and Monticello, obliterating those old routes. The Woolen Mills/Carlton approaches exist in only on maps; Monticello Road is in two disconnected segments (one of which is completely disused) and the Monticello Avenue approach was widened to a four lane divided highway without sidewalk. 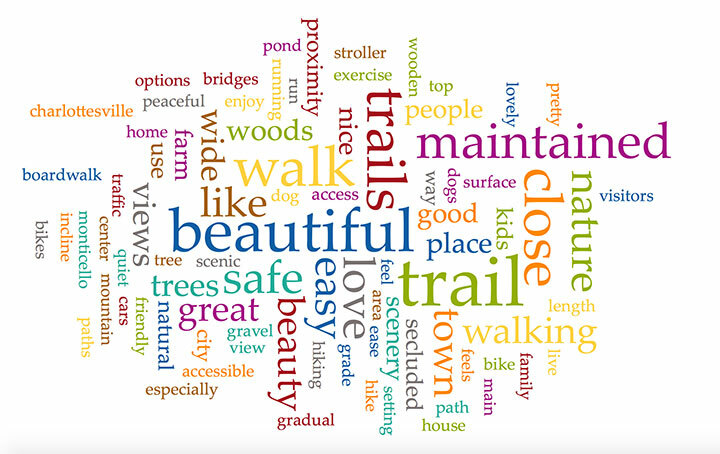 This text is extracted from my pre-assessment report, Reconnecting Heritage: Pedestrian and Bicycle Connectivity to Monticello, The executive summary and full text of that report will be available soon. 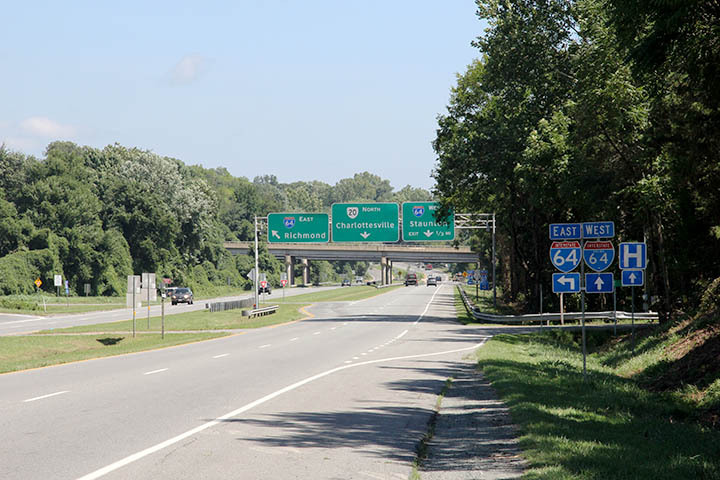 Route 20 was widened and Interstate 64 was built to help people get around, yet they make it difficult and unsafe for pedestrians and cyclists to get to Monticello. 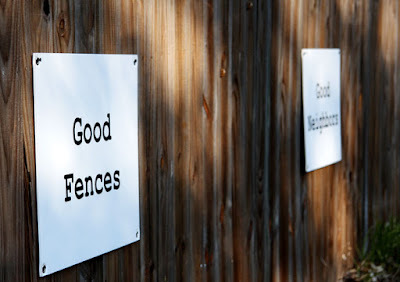 Bridging that barrier poses difficulties that are physical, psychological and bureaucratic. This essay warns that plans to mitigate obdurate and problematic infrastructure can themselves become resistant to input and improvement. Yet, a visioning process that truly listens has the potential create positive change. Anique Hommels illuminates a fundamental question facing planners who wish to change the world: the built environment—especially infrastructure—has a powerful incumbency that makes it very challenging to displace or modify. Aside from the broader truth that the status quo always has home-field advantage, one must reckon with issues of cost, interdependency with other systems, inconvenience and disruption but also the idea that physical forms shape human processes and thinking. In my Monticello project, I am trying to find a way to get pedestrians safely past an interstate in general and a cloverleaf interchange in particular. That highway is a powerful fact-on-the ground that cannot be ignored: it is the prevailing reality. There will be costs and perhaps inconvenience associated with rejiggering the ramps to make them safe. However, I foresee a trickier social process problem in convincing the state’s highway engineers to modify their traditional approach—for example by substituting a right-angle turn for a cloverleaf or even adding a new light, crosswalk or stop sign. That’s not how they do things; it’s not in their protocols. The Belmont Carlton Neighborhood Association received a visit from Christopher Henry of Stony Point Design/Build. 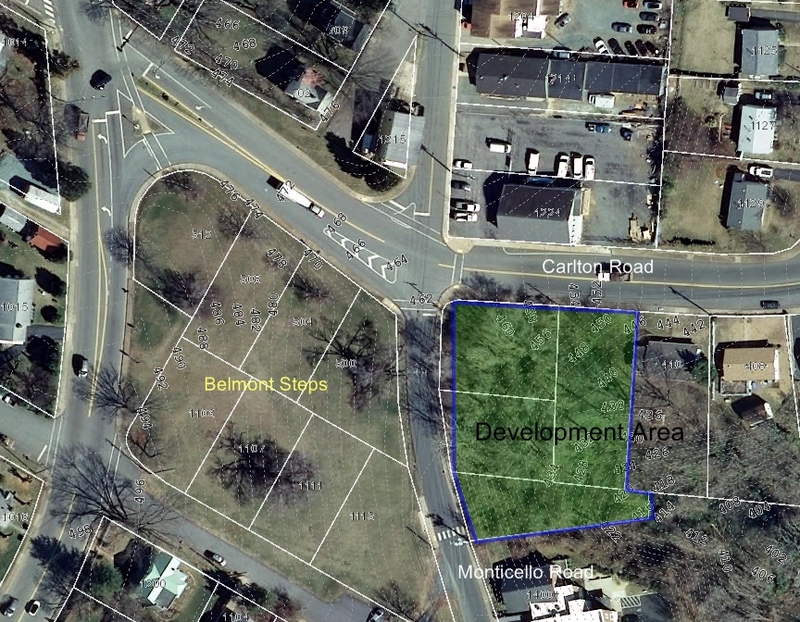 He was there to talk about an idea—still very much in the preliminary stage—of developing a small cluster of lots totaling about 2/3 acre at the corner of Carlton and Monticello Roads. 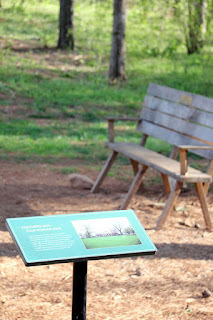 This blog visited that site a few years ago on a backyard biophilia safari. Before I go any further, I would like to praise Mr Henry for two things that, should it go forward, will make the project more likely to succeed with the Planning Commission as well as with its future neighbors. First of all, he obviously read Charlottesville’s Comprehensive Plan and came up with a project that aligns with the City’s goals and values, particularly as respects diverse housing opportunities. Second, and most important, he’s talking early: meeting with planners and listening to the community BEFORE getting invested in a specific execution or set of plans. 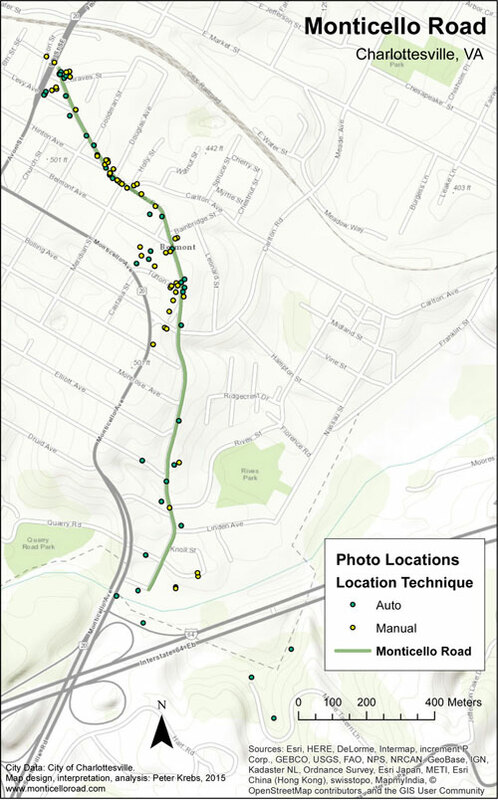 I often receive process questions about the project, especially as pertains to what parts of the neighborhood I photograph and I how I define the boundaries of the Monticello Road study area. I typically answer that I consciously limit the project to the street and directly-adjacent properties and I believe that the images will be distributed throughout the length of the street—though not evenly, perhaps clustered around my home or a few places where I spend sedentary time. These responses are logical but not empirical. 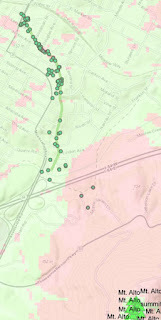 GIS analysis lets us answer the question with data. Through the life of the project, I have captured thousands of images, which would have been overwhelming. One of the features of photography is that it not particularly relevant if an image is made; what matters is which images are seen. I have a subset of selects (numbering in the low hundreds) that are used in the book and the frequent slideshows I present. That provides a further curation because it reflects both a photographer’s view of what is visually interesting and an editor’s view of what says something about the place. I refined my selection one more time by eliminating multiple images all taken at the same time (different people at the same party, for example). Through this process, I reduced the sample to 94 images, a highly manageable number, but enough for a meaningful analysis of a linear mile-long space. Two photos from the same spot, taken three years apart. Left: "The Park, 2012." 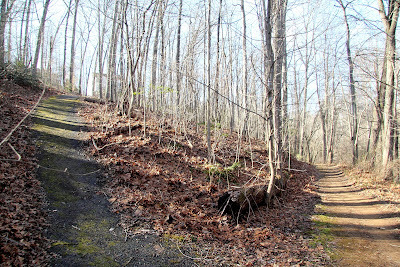 Right "Belmont Steps subdivision, 2015." 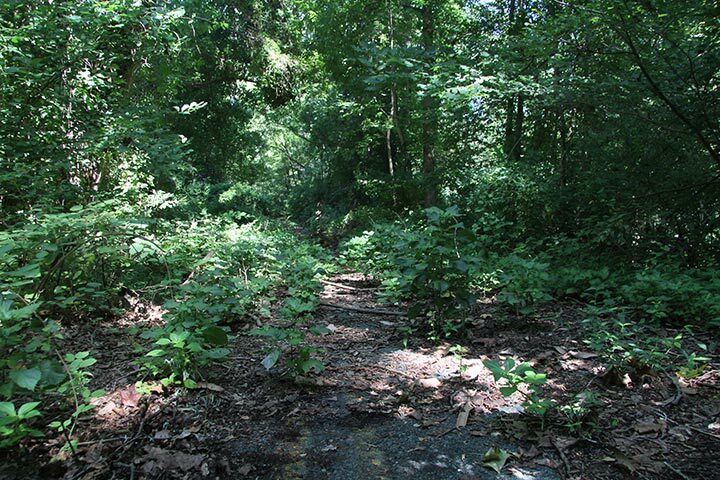 Although it is not the main purpose, the Monticello Road project provides undeniable (and sometimes wrenching) evidence of the ways the neighborhood changes over time. The above pairing is especially jarring. 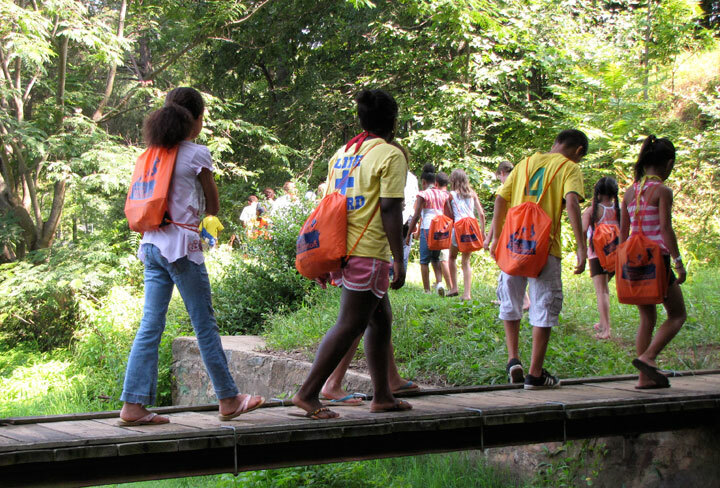 We know that frequent low-dose exposure to Nature is beneficial to health and well-being. I suspect that the same can be said of Heritage as well so its loss is something we notice. When one of my colleagues saw the above photo, he was surprised to hear that the Neighborhood Association did not oppose the subdivision. In fact, there was nothing for them to say about it because it was done by-right, meaning the land-owner did not need anyone's permission as long as they stayed within the zoning regulations, which they did. 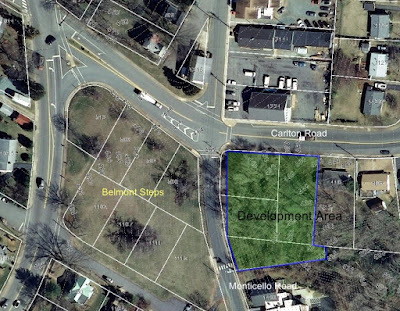 Additionally, we say all the time that we like in-fill development (instead of sprawl) and this is what it looks like. So although this kind of change is inevitable and possibly beneficial, we should not pretend that there is no cost. We know there is, but it is not quantifiable, which is a real liability when we consider the pocket full of financial statistics a developer will present. GIS allows quantitative viewshed analysis and I thought it would be interesting to look at the cumulative effect of building upon the the landscape and heritage vistas in the neighborhood. For reference, I chose the peak of Mont Alto, so beautifully framed in the photo above left. It's essential that we get more people--especially kids--into the woods. It's definitely possible to do so without harm--but it will require some work. 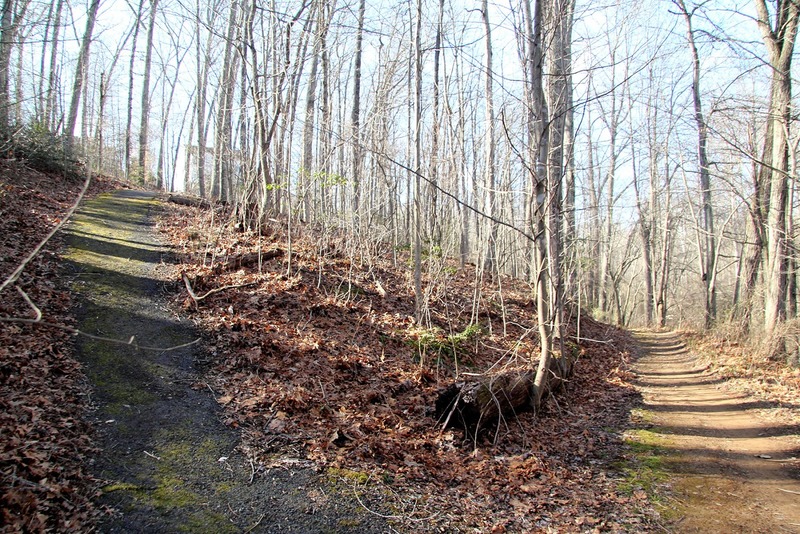 Here's a brief I emailed to Charlottesville City Council about a proposal to open up the Ragged Mountain Natural Area to runners, cyclists and leashed dogs, which are currently prohibited. Council response follows in the comment section. I had hoped to write you a proper brief about Ragged Mountain and even testify at the meeting tonight, but I have another commitment and won't be able to make it. I believe that if it will not interfere with drinking water quality, then allowable uses should be expanded. It needs to be a zone of active teaching and it is an opportunity and responsibility that must be shared with Albemarle County. I hope to bring the planning community some news ways of seeing communities and the people who live there. I’m really excited to announce what many people already know: I will be joining the Master of Urban and Environmental Studies program at the University of Virginia this fall. It’s a two-year program. Meantime I will work the next marathon in a limited capacity, while concentrating primarily on my studies. While I am there, I plan to focus improving the front end of the planning process through community discovery (which so often falls woefully short) through the arts and bringing a focus on improvements in well-being, which includes a host of under-appreciated aspects such as access to heritage, spiritual exploration, fresh air and exercise, healthy foods, opportunities for expression and engagement with neighbors. 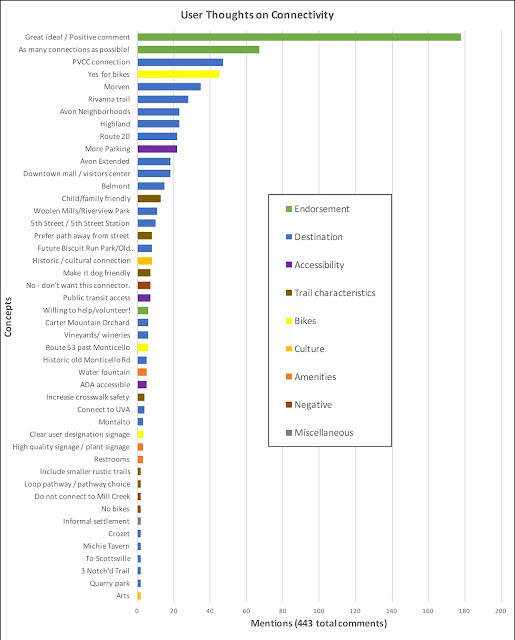 These are topics familiar to readers of this blog. So it’s really the perfect extension of the work I’m doing. I’m going deeper by learning more, by contributing to a wider discussion with unique perspectives I’ve gathered and—not insignificantly—obtaining an accreditation that will help realize some of the ideas we’ve discussed together here. The site chosen by the Tom Tom Founders Festival (the corner of Garrett and 6th Street in Charlottesville) for its City as Canvas mural project was already slated for a capstone expression in the Bridge PAI’s Play the City program. 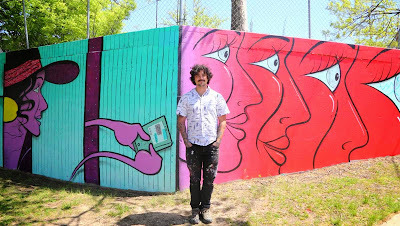 My initial reaction was to ask myself, “Doesn’t anyone talk to each other around here?” As I dug deeper and spent time with artist Mickael Broth and his project, I came to the conclusion that it really doesn’t matter. We should just celebrate the mural, which is pretty cool and it's real. The site was not just a blank wall—it’s at the heart of a major urban renewal project that effectively erased a neighborhood and replaced it with a new housing project, which is in its turn now the subject of intense speculation. Bitterness about the erasure of history cohabits the zone with nervous speculation about the future, along the historic 6th Street right-of-way and steps from multiple public housing complexes with many children. 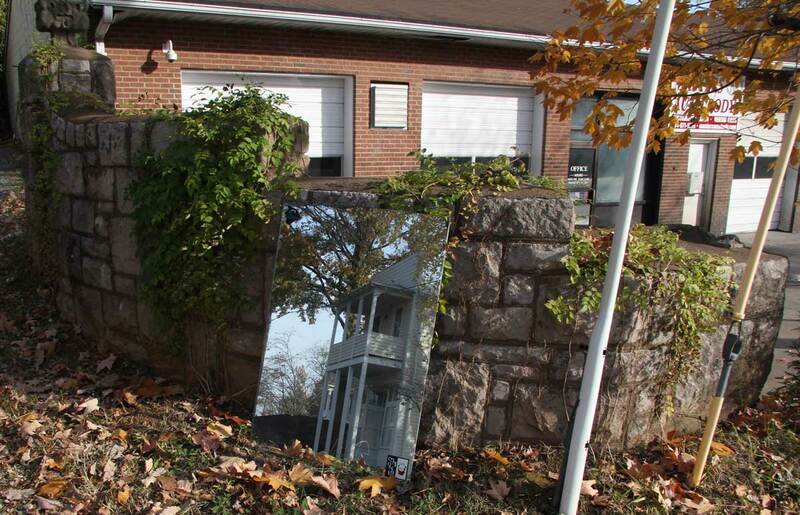 The location offered a tremendous opportunity for the community to work through some of its issues through the arts and make a strong statement with its own ideas about its specific dreams and desires. That’s an ambitious goal. Meanwhile, the Tom Tom organizers saw an opportunity to make a mark of their own. They reached a private deal with the landowner (no public bodies needed to be consulted in this case) and they hired an artist from Richmond, essentially freezing out community discussion. The result would undoubtedly be livelier than the status quo, but perhaps a missed opportunity to have something more layered, in line with advanced contemporary thinking on public art.